If you were too busy getting ready for the new season of “Game of Thrones” and/or “Silicon Valley,” here’s what you missed on social media. Instagram Introduces Color and Fade Tools: Instagram added Color and Fade to its range of image editing tools. Color lets Instagram add color tint to the photos. The color selection includes “yellow, orange, red, pink, purple, blue, cyan or green.” Fade allows users to soften the color of images. Twitter Now Offers Retweet with Comment: Retweeting with comment is now available on Twitter. 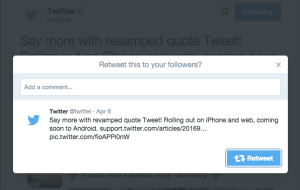 The feature is available for Twitter on the web to be followed by iOS and Android. Twitter Adds Slow-Motion Video Upload for iPhone: Slow-motion video upload and sharing is now available for Twitter iPhone users. There’s no word yet when this will be available for Android or Windows phone users. Twitter Updates Tailored Trends on Mobile App: Twitter has updated the “Tailored Trends” feature on their mobile app to make it easier to access and navigate. The improved feature can be found in the latest updates to their iOS and Android apps in the US.